Breast milk or infant formula is the primary source of nutrition in the first 6 months of a baby’s life. During the second 6 months (6-12 months) of life, other foods and beverages are required for nutritional and developmental reasons. It is generally agreed that solids should be introduced no earlier than 4 months and no later than 6 months. 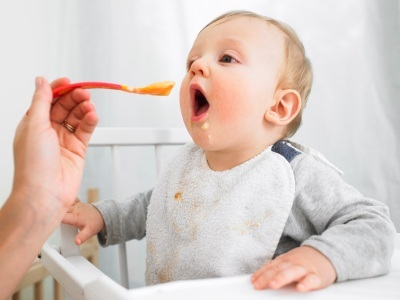 However, it is important to use the infant’s signs of readiness to introducing solids.3,4 Each baby will develop at their own pace, and demonstrate readiness for solids at different ages. The baby’s gastro-intestinal tract and kidneys need to be mature enough to process complementary foods, including solids and new liquids. The baby needs to have lost the extrusion reflex (infants reject food placed on the tip of the tongue) and developed the ability to chew using their gums. Beyond 6 months, breast milk is no longer adequate to meet baby’s nutritional needs for energy, protein, fat and micronutrients. At this stage, most infants are ready to transition from milk feeds (breast milk or infant formula) to family foods. Adequate fat, protein, iron and zinc, provided by good quality complementary foods, are essential during the second 6 months of life, when energy requirements are high and growth is rapid. Iron rich foods are an essential part of a baby’s diet. From 6 months, baby’s stores of iron are depleted, so food sources must be introduced to meet the baby’s nutrient needs. For the breastfed baby, more than 90% of iron requirements need to be provided by solids during the second 6 months of life. For the formula fed baby, iron fortified infant formulas are available. Iron fortified infant cereals are recommended; the absorption of the iron will be enhanced if a vitamin C source, such orange or tomato, accompanies the meal. Foods that are naturally high in iron, especially beef and lamb, are also naturally high in zinc. Zinc is another important mineral that is vital during this rapid growth phase. Cow’s milk is not recommended as a drink until after 24 months of age. Cow’s milk is unsuitable for a number of reasons including the type and amount of protein, the amount of carbohydrate, the type of fat, as well as the ability of the infant to absorb the vitamins and minerals present. Full fat cow’s milk can be used in cooking, however reduced fat or skim cow’s milk is not recommended at all as it is too low in energy. When baby is ready for solids, commence with very small amounts (1 teaspoonful) and increase the quantity of the new food gradually. Only give one new food at a time and wait 2 to 3 days before commencing the next new food, to check for food allergy or intolerance. Soymilk and goat’s milk are not recommended for allergy prevention; infants may be prescribed a hypoallergenic milk to manage their allergies.7 Discuss appropriate options with an accredited practising dietitian (APD), or your GP. If your child exhibits any signs of a food reaction you should seek medical advice and avoid that food until you have consulted a medical practitioner with expertise in food allergy. If an infant is given a vegetarian diet it is important that sufficient high energy and high protein foods are given. Sufficient milk (approximately 500mL per day) and full fat dairy products as well as legumes and pulses are recommended. Vegan diets are discouraged in infancy, particularly due to the real risk of vitamin B12 deficiency, which adversely affects brain and nerve development.4 Seek advice from an accredited practising dietitian (APD), to ensure your baby achieves adequate nutrition for growth and development. Salt is not recommended for baby’s foods, including home meals and snacks as well as processed foods, as their tiny kidneys cannot cope with the processing of this sodium. Higher sodium intake even in the early years is associated with higher blood pressure in later life.5 An infant can also become accustomed to salty foods, which may affect future taste preferences and lead to health problems. Sugar plays a role in the development of dental caries. Infants naturally prefer sweet foods / liquids, so it is important to start good dental hygiene practices early, even before the first tooth erupts. Whilst older children instinctively prefer high energy foods with sweet and salty tastes; and reject new foods, these predispositions may be modified during infancy when baby is receptive to the introduction of a wide variety of foods and tastes. Make the most of this opportunity! Parents and carers of infants play a crucial role in establishing good dietary habits that will impact the health and development of the child in the short and long term. This is a great time for the whole household to ensure that they are practicing healthy eating habits for the benefit of all. 1. WHO: The Optimal Duration of Exclusive Breastfeeding. Report of an Expert Consultation. Geneva, WHO, 2001. 2. Fewtrell MS, Morgan JB, Duggan C, Gunnlaugsson G, Hibberd P, Lucas A, and Kleinman RE 2007: Optimal duration of exclusive breastfeeding: what is the evidence to support current recommendations? American Journal of Clinical Nutrition; 85S:635-8. 3. Weaning infants onto solid foods. Paediatric Group of the Dietetic Association Position Paper. 4. Koletzko B 2008. Pediatric Nutrition in Practice. Karger, Switzerland. 5. Geleijnse JM, Hofman A, Witteman JC et al, 1997. Long term effects of neonatal sodium restriction on blood pressure. Hypertension: 29;913-7. 6. Norris JM, Barriga K, Hofenberg EJ et al, 2005. Risk of coeliac disease autoimmunity and timing of gluten introduction in the diet of infants at increased risk of disease. JAMA;293:2343-51.